There's a New 4K Special Edition WATERWORLD Blu-ray Coming! The best movie ever made is getting a very special release from Arrow video. the Waterworld: Two-Disc Limited Edition Blu-ray will be released on 12/11 and will feature a new 4K restoration and 3 VERSION OF THE FILM! First it will have the original theatrical cut, the extended US TV cut (which runs over 40 minutes longer), and the extended European “Ulysses” cut which includes censored shots and dialogue. For special features it will have an all-new feature-length documentary called Maelstrom: The Odyssey of Waterworld. You can order the edition here. 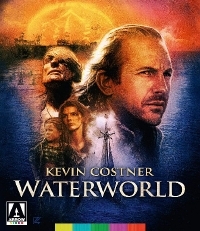 A definitive post-apocalypse blockbuster, Waterworld stars Kevin Costner (The Untouchables) as The Mariner - a mutant trader, adrift in a dystopian future where Earth is submerged under water and humankind struggles to survive on boats and in ramshackle floating cities. The Mariner becomes embroiled with the Smokers, a gang of pirates who, led by villainous leader Deacon (Dennis Hopper, Blue Velvet), are seeking Enola (Tina Majorino, Napoleon Dynamite), a girl with a map to the mythical realm of ''Dryland'' tattooed on her back.